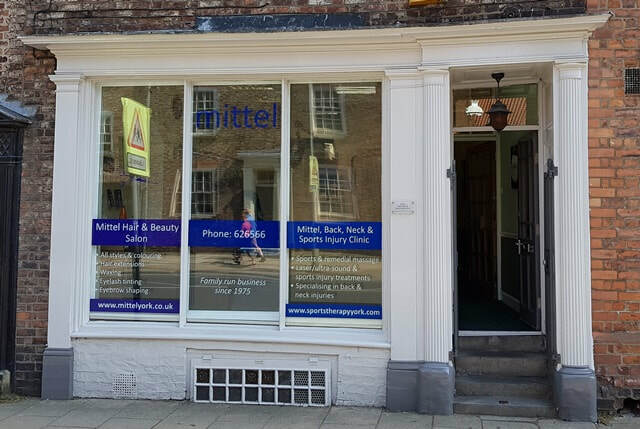 If you would like to book a Hair or Beauty appointment or a Sports Therapy session you can either drop in, give us a call, or send us an email. If you're not sure if you need treatment or not, feel free to call us to discuss your symptoms with Debbie or a member of her Hair and Beauty Team or her Sports Clinic Team. Parking is available in the Sainsbury’s car-park, located near the rear of the clinic, or in St John’s car-park located just off Lord Mayors Walk. There are 3 bus services (12, 13, 181) which stop across the road in Monkgate near the NHS drop-in centre.